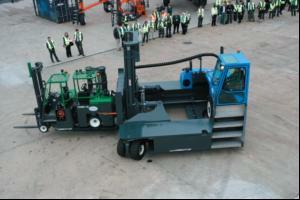 Combilift has launched its largest 4-way forklift, the 25 tonne capacity C25000.With dimensions of around 5x5m, an unladen weight of 32t and a 127kW engine, the truck has been designed in response to developments in heavy industries with companies looking for safer and more efficient methods of handling larger loads. The C25000 resembles a standard Combilift but on a much larger scale. The manufacturer says the implications of designing and building a truck almost twice as large as any existing model called for some innovative engineering and manufacturing solutions. The Kubota engines used as standard in the diesel powered Combilift range did not offer the required HP for a model of this size, and after a thorough analysis of the market Combilift opted for a John Deere engine. "We chose the John Deere 6068 HF not only because of its 170 HP capacity but also because we found it to be the quietest and most environmentally friendly option," says md Martin McVicar. "We were definitely faced with some issues when we embarked on this project," adds McVicar. "But our engineers once again rose to the challenge to create a Combilift which will do the job perfectly for the customer and which is remarkably manoeuvrable considering its size." Blade room project Modular building firm BladeRoom is taking delivery of a C25000 model. Bladeroom produces energy efficient data centres and needs a sound handling system at its new production facility in Cinderford, Gloucestershire. Having looked at a number of conventional handling vehicles on the market, it became apparent that they were not going to be up to the challenge of easily and quickly manouevering the 14x4.2m finished modules in and around the site. BladeRoom's materials handling consultants HFT Forklifts (Hereford) investigated various possibilities including overhead gantry cranes and very large counterbalance trucks. The cranes proved to be too inflexible, not practical to install in an L shaped building and extremely expensive. The sheer physical size of a counterbalance forklift capable of moving loads of 18t at extended load centres would have taken up far too much space in the manufacturing area. "Materials handling is a crucial part of the build process" says BladeRoom CEO Paul Rogers. "With the help of Kevin Heath at HFT we realised that one possibility was a much larger version of the 12t and 14t capacity Combilifts that we were already using. These have been invaluable for moving raw materials such as 14m long RSJ's and for lifting assembled roof units onto base units, so it seemed sensible to also look at a 4-way customised approach to handle the finished modules." Together with Combilift's official distributor in the West Midlands Abex, and Combilift design engineers at the factory in Monaghan, specifications were drawn up for the super sized C25000 model. Its capacity will allow BladeRoom to easily lift the fully fitted modules into place for pre delivery testing. "The ideal solution from our point of view was a machine that could move modules in the same way as other operations move pallets - just on a much larger scale of course" adds Rogers. In spite of the truck's size - it measures 5m by 5m, with a 3.2m high cab, its exceptional manoeuvrability will enable BladeRoom to lay out the manufacturing area more efficiently. Modules will be placed in rows to allow the Combilift to travel sideways along gangways between them, and the 4m lift height will enable modules to be doubled stacked. BladeRoom's quality modular data centres can be supplied in 18 or 20 weeks compared to the equivalent in months for the construction of traditional structures. The Combilift's flexibility to "go anywhere and do anything" as Rogers puts it, will enable the company to proceed at the required pace to fulfil orders on the books as well as to cope with the growth it expects due to more and more interest from major firms around the world.